Schwartz & Wade, 9780375872808, 22pp. New York Times bestselling author and illustrator Tad Hills brings our favorite feathered friends out to celebrate spring in this sturdy board book. Duck & Goose have lots of ideas about how to find the Easter Bunny, but will they succeed? 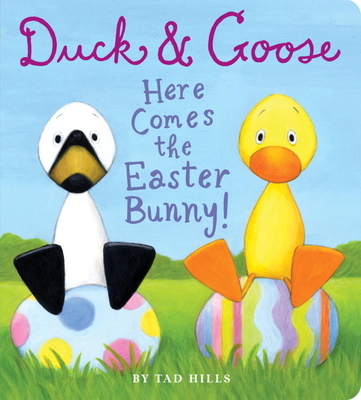 Preschoolers won't be able to resist this latest board book featuring Duck & Goose, lots of colorful eggs, and the Easter Bunny." TAD HILLS is the author and illustrator of the ALA Notable Book Duck & Goose and Duck, Duck, Goose, both New York Times bestsellers. His Duck & Goose board books include the ALA Notable Book What's Up Duck?, and the Indie bestsellers, Duck & Goose Find a Pumpkin and Duck & Goose: It's Time for Christmas. He is also the author-illustrator of the New York Times bestselling How Rocket Learned to Read, which Kirkus Reviews calls "a paean to the joy of reading and the teachers that inspire it. Lovely."